You have heard of HTML5.HTML5 is one of the hottest web technologies and much talked about as well.Major web browsers like Firefox and Chrome support HTML5.HTML5 supports Video tags.Video tags are just like other HTML tags (say for example <p> para tags). Webm videos can be played by browsers like Firefox and Chrome.The only thing you need to do is use video tag.We will see the exact syntax later on. Most of the video players do not have option to load these files only if there is video on that page.So overall performance of your website goes down.This becomes real problematic if your page is viewed on mobile.So using Webm video format helps you reduce your website load time. HTML5 video tag can also play other video format like mp4 and .ogg.But Firefox does not support mp4 video format.But Webm is supported by most browsers except Internet Explorer.So you would be serving pages faster to most of your viewers. Now chances are that your videos are not in webm format as of now.This is quite understandable as webm is not very popular media format.With YouTube using webm media format things will change with time.So in order to use Webm on your website you need to convert your existing videos to webm format. To convert your existing video files to webm files We will be using VLC media player.The reason is that it is open source and completely free.So getting VLC installed on your system is not an issue.Chances are that you already have VLC installed on your system. After downloading install VLC media player.After installing it open VLC media player. 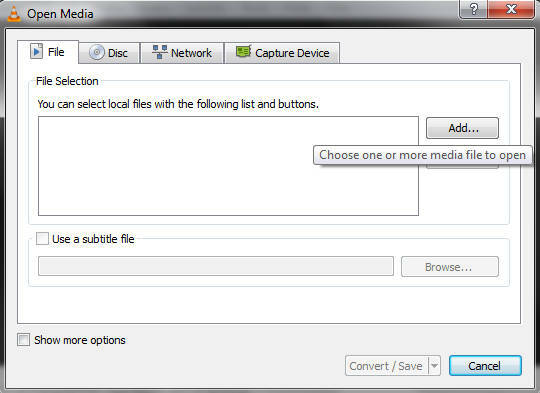 Click on Media option.After clicking you can see Convert / Save option as shown in below image. 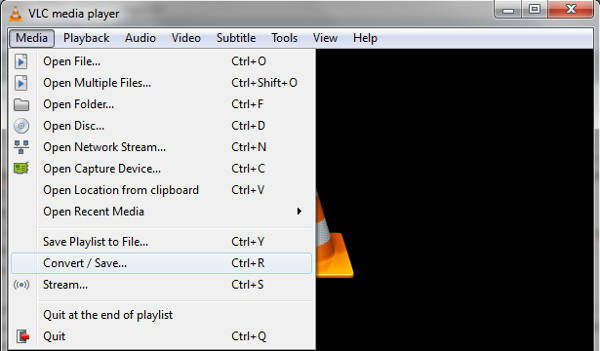 After selecting the files click on Convert / Save screen of above screen.This will display a new screen as shown below.From the drop down next to Profile select the option Video VP80 + Vorbis (Webm).There are lot of other options mentioned.You can create other video format files from this screen.I convert a video to different format using this screen to check file size of each video format. After selecting the profile you need to select output file name.If you are not selecting output file name then VLC will create the converted output file in VLC folder.So I prefer selecting output file name. After giving the destination file name click on convert/save option to convert the file from existing format to webm format. I converted mov file to .ogg file, .mp4 file and .webm file.This was performed to check file size of different video formats.The larger the file size the more time to load it will take.So if any format has low file size but retains the video quality then it is desirable.I wanted to check webm on this criteria before using it on my websites. The file size of .ogg file was smallest followed by webm and mp4.So mp4 has the largest file size of the three.Same mov file was used to generate all the three files using VLC media player converter.I did not dug too deep into the matter.But I went on to use webm format on this site.There was no decrease in video quality as well. Embedding video on website is not a simple task.There was no simple tag available in HTML prior to HTML5 to embed video on your website.HTML provides img tag to add images on your website.But there were no such tags for videos.But things changed in HTML5.HTML5 provides video tag to add videos on your website similar to that of img tag for images. So earlier to add videos on website people used different video players.Many content management system like WordPress had plugins created just for this purpose.So all pages of your website saw slow load time because you wanted to add one video on a page. HTML5 does made things easy by proving video tag.But the problem was too many video formats.Not all formats were supported by all browsers or majority of browsers.Before using webm on this site I thought of using mp4 format.Actually I was trying not to use any plugin yet use videos on my site.On this task I had option to use HTML5 video tag and video format supported by majority of browsers and having decent file size. The choice was narrowed down to mp4,ogg and webm.The problem was that Firefox does not support mp4.So option was to deliver ogg file to Firefox and mp4 to other browsers.Also mp4 file size is greater than webm file size for same video quality. So I decided to go with webm video format.Internet Explorer does not support webm video file but market share of it is going down.Also I had option to deliver mp4 file to Internet Explorer while delivering webm to other browsers. Feel free to share your thoughts or queries.Consider sharing the post in case you found this useful.